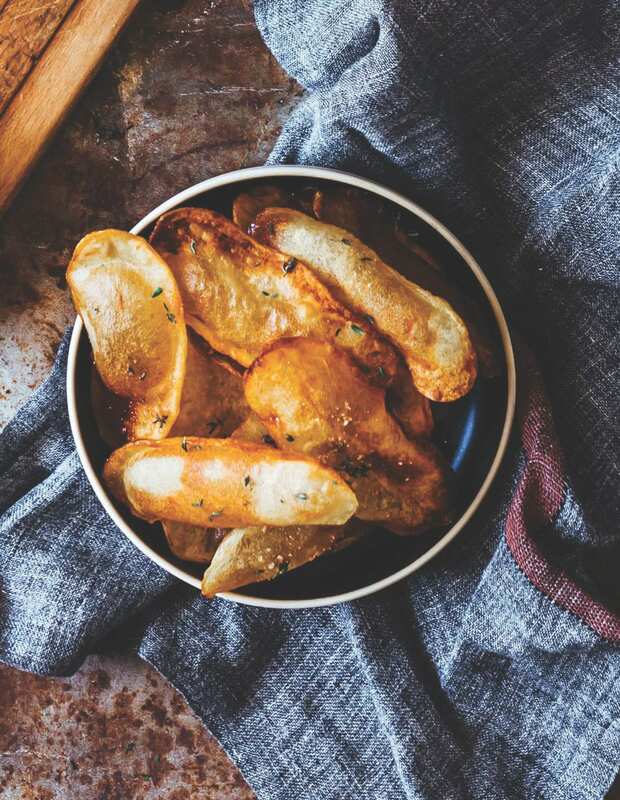 Double-frying thinly sliced potatoes in two different oil temperatures results in puffy, crispy, totally addictive homemade gluten free potato chips. MAKES ABOUT 50 CHIPS You can fry these the first time in the 325°F oil up to 12 hours in advance, then keep them on a baking sheet at room temperature until ready to proceed with the second frying at 365ºF right before serving. For best results, use a deep-fry thermometer. Pour enough vegetable oil into a large saucepan or pot to come 2-1/2 inches up the side of the pan. Heat the oil over medium-high heat until a deep-fry thermometer reads 325°F. Meanwhile, combine the thyme and salt in a small bowl and crush the mixture together with your fingers until well combined. Set aside. Have ready a bowl of cold water. Using a mandoline, slice the potatoes lengthwise into slices 1/8-inch-thick and place in the bowl of water. Thoroughly dry each potato slice between paper towels or clean dishtowels and place on a baking sheet. Working in batches to avoid crowding, drop 8 to 12 potato slices into the oil, being careful not to splash yourself as the oil bubbles aggressively. Gently shake the pan back and forth until the potato slices are not browned but have small blisters and have risen to the surface, 3 to 4 minutes. With a slotted spoon, lift up the potatoes to let excess oil drip off and place the slices back on the baking sheet. Repeat with the remaining potatoes. Bring the oil temperature to 365°F and line another baking sheet with paper towels. Working in batches of 10, add the pre-fried slices to the hotter oil, gently moving them around so they cook evenly until they puff up, crisp, and turn golden brown, 2 to 3 minutes. Using a slotted spoon, move the chips to the paper towel–lined baking sheet to drain and immediately sprinkle with the thyme salt. Repeat with the remaining potatoes, transfer to a serving bowl, and enjoy.